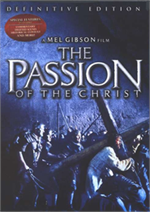 From Academy Award winning director Mel Gibson comes a profound story of courage and sacrifice, depicting the final twelve hours in the life of Jesus Christ. Featuring stunning cinematography and an inspired performance by Jim Caviezel, The Passion of the Christ is a triumphant and uncompromising filmmaking achievement. This long-awaited, 2-disc, Definitive Edition DVD set provides the viewer with hours of behind-the-scenes material. Aramaic/Latin/Hebrew languages with English and Spanish subtitles. Rated R (for sequences of graphic violence). Closed captioned. Widescreen. Region 1. Approx. 126 minutes.